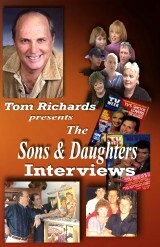 Features interviews with Pat the Rat and other stars from the popular Australian television series Sons and Daughters. Presented by Tom Richards, who played David Palmer. Tom takes us to different locations the show used in Sydney and Melbourne and explains why Sons and Daughters was so successful. Also includes interviews with English fans. Running time approx 60 minutes. Price for DVD (PAL): Aus$30 plus postage and handling. Click here for a larger version of the DVD cover (use your browser's 'Back' button to return to this page) and continue reading for a review of the DVD. This DVD is a fascinating release. Several years in the making - it's clear that filming began in 2001 (as demonstrated by a reference to filming on Sons and Daughters having finished fourteen years earlier (in 1987)), but with the shots used of this website having been recorded in 2007 - Tom Richards presents an hour-long documentary which features several former members of the cast, fan input from Australia and the UK (including a just-about-watchable couple of appearances from myself!) and a look at a number of the locations used in the series. If one is to look back at Sons and Daughters through the eyes of its stars, it is essential that those stars include the show's most popular characters - and fortunately there's no disappointment on that front. Rowena Wallace (Patricia Hamilton/Morrell/Palmer) is given ample screen-time, as is her 'alter ego', Belinda Giblin (Alison Carr), who reflects on the challenge of taking over playing such a popular character at Patricia. We also get to hear from Ian Rawlings (Wayne Hamilton), who explains exactly how nervous he was on his first day of filming and reveals how he almost came to be axed after just three months. The interviews with former cast members continue with Leila Hayes (Beryl Palmer/Hamilton), Stephen Comey (Kevin Palmer), Ken James (Mike O'Brien), Rona Coleman (Heather O'Brien), Danny Roberts (Andy Green), Sarah Kemp (Charlie Bartlett) and Judy Nunn (Irene Fisher). Each talks about how they came to land their role in Sons and Daughters and relates anecdotes about their time in the series. Rona Coleman's story about the burning-down of the O'Briens' house is particularly amusing! We also get to find out what the stars have been doing in the years since they left Sons and Daughters - and Rowena Wallace makes some particularly interesting comments about her return to the series in 1987 as Pamela Hudson. Between these interviews, Tom Richards tells us his own stories about his time in the show and explains why he left in 1986. As well as the former stars, Tom talks to Bevan Lee, who wrote numerous episodes and worked as script editor on the series. Lee explains how he came up with the 1982 and 1983 season finales. There's also an interview with regular Director, Russell Webb. And then there are the fan comments! These were filmed almost exactly six years ago, in October 2001: Tom met Australian fan, Danielle, at her home where, in the DVD she talks about why she created her web tribute to Rowena Wallace and about how Sons and Daughters led to marriage for her; and myself, Ian (now of thesoapshow.com) and another fan, Pat, in St. James's Park, London, and you can see me explain about my creation of this website and Ian and Pat talk about why they were such fans of Sons and Daughters. I remember being very flattered back in 2001 when Tom told me that this website was his inspiration for putting together the documentary - and he reiterates this fact on the DVD. In terms of content, I can't fault this disc: it's great to see the former stars of Sons and Daughters reminiscing - and it's astonishing to see how little some of them have changed since the late-80s! The only minor letdowns - and I stress that these are minor - are that the sound is inconsistent, meaning I had to keep adjusting the volume; and some of the editing is not all that smooth in places. And as a pedant of English grammar and spelling, I was slightly annoyed by the lack of care on the opening copyright captions, where there are some misspellings; and on the back of the DVD cover, Bevan Lee is referred to as 'Scrpit (sic) Editor' - a silly mistake that could easily have been avoided with a little more care. But those are only minor grumbles and certainly won't affect your enjoyment of this DVD if you buy it - and I do recommend that you buy it! Overall, I'd give it a rating of 4½ out of 5.